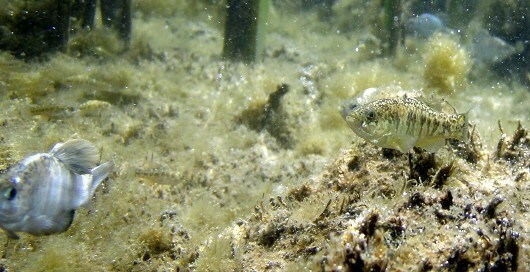 The Yarkon bleak Acanthobrama telavivensis is a small minnow native to Israel’s coastal river systems. It is an unremarkable fish, really, silvery in color and reaching a maximum length of only 20 cm (about 8 in). Unremarkable except that it is one of a few species of fish that became extinct in the wild and was later successfully reintroduced back into its native range. According to a recent article by Isreal21C, the Yarkon bleak once was widespread in Israel’s coastal river systems, but by the latter half of the 20th century the fish had disappeared from every waterway except the Yarkon River and one stream, the Tut, due to pollution and water withdrawls for agriculture. The effects of these practices were compounded by a period of drought, which culminated in 1999. By that time only three small isolated populations of Yarkon bleak, comprising some 150 individuals, survived and the species was on the brink of extinction. Menachem Goren of Tel Aviv University collected the remaining Yarkon bleak and brought them into the laboratory for propagation. The 120 fish that survived were carefully bred and, five years later, the number of fish at the university grew to over 14,000. In the winter of 2002-2003, about 5,000 adult fish were reintroduced into the Yarkon river to great fanfare. Unfortunately, the reintroduction was a failure: although the fish survived, they did not reproduce. Due to a lack of appropriate spawning habitat, it was believed. By 2004 the Yarkon bleak was considered “critically endangered” and in 2006 it was officially classified as extinct in the wild. After the first unsuccessful reintroduction attempt, spawning habitat for the fish was created in several rivers. During the winter of 2006-2007, Goren’s team reintroduced some 9,000 laboratory-bred bleak into the Yarkon and other rivers in central and northern Israel. Subsequent surveys have shown increasing numbers of the fish, including juveniles, at most of the release sites. Three or four generations later, the population has increased significantly. “To the best of my knowledge, this is the first time an extinct-in-the-wild fish species has been successfully reintroduced. We have proved that an imperiled fish species can be saved,” Goren says. This is a great success story, but it is not the first such reintroduction, nor the only such success. In 1969, Phil Pister a biologist with the California Department of Fish and Game (USA) arrived at Fish Slough in the north end of Owens Valley (California) in time to witness the next-to-last gasp of the remaining individuals of Owens Valley pupfish Cyprinodon radiosus as water levels dropped in their last remaining habitat, threatening the species with extinction. Pister captured and relocated 800 pupfish-the founding population of all remaining Owens Valley pupfish today- in two buckets. Since then, small populations have been established in several refuges in the Owens Valley in areas supplied by spring flows or groundwater. To Beel, it seems that one of the more remarkable aspects of the Yarkon bleak story is that the online stories about this success are not followed by numerous comments from people who question the value or legitimacy of conserving anything other than game fish, particularly largemouth bass. 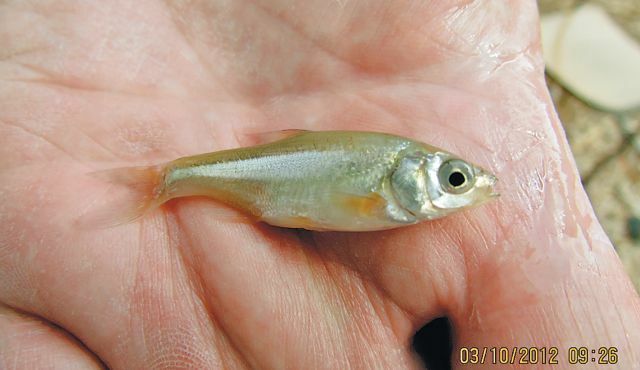 This entry was posted on February 25, 2013 by denstormer in Conservation, Natural History and tagged little fishes, minnows.